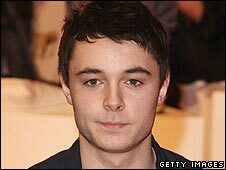 Scottish singer Leon Jackson, winner of The X Factor in 2007, has been dropped by his record label after one album. A spokeswoman for Sony BMG label Syco Music confirmed the 20-year-old was no longer with the company. "I had a great year and learned so much recording and releasing my album," said Jackson, who released his debut record, Right Now, last October. "Every artist knows these things can go either way. I'm really looking forward to my tour and doing more writing." Jackson won the 2007 series of The X Factor, beating 24-year-old Welsh favourite Rhydian Roberts in the final. He went on to have a Christmas number one with the single When You Believe. However, his follow-up - Don't Call this Love - failed to reach the top spot last October. Right Now, released shortly afterwards, reportedly sold 130,000 copies. A spokeswoman for Syco, the Sony division to which Leon was signed, said that it "wished him well." Some fans have reacted angrily to the announcement, though, claiming the label did not do enough to promote Jackson's music.